But when I look outside, totally not.. Does that sounds like Spring too you?? 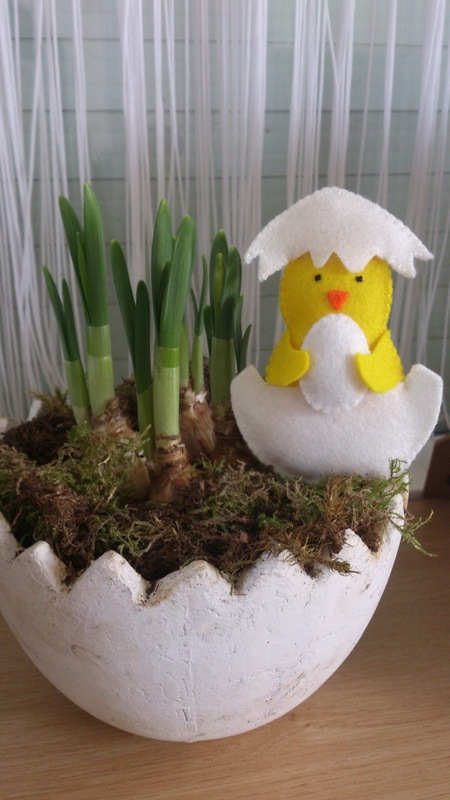 But inside we have Spring with the lovely Daffodils, Easter crafts. But to bad that Noah is ill again, he has a big fever. Hopefully he is better soon. On the MS blog from Nia, I entered a Exchange. My part needed to be send to Olga. She told me she liked it, so I'm happy!! Feels so great Sping in my house..
What will I make some.. so many idea's so little time!! At this moment I think I see a sun coming... YEAH!! when will you come back sun ??? Oh, die is heel mooi en heel erg schattig! Happy Spring Annette, hopefully soon we will have long sunny warm days! Poor Noah, not fun to be unwell again, sending big hugs to make him better again soon. No spring yet here either.. very cold. But at least it's springy from the crafty viewpoint. Very cute stuff. Hope Noah gets better soon and you all stay healthy for spring... it has to be coming soon! Wat een schatje voor Olga, ik weet zeker dat ze er heel blij mee is. Hahahah je kipje met hoed is een lieverd. Oh wat is je borduur werkje prachtig leuk zeg Annette ! Ohhh your little felt chick is so cute :D and so is you stitching for this exchange :) Thank you sweetie, thank you for your participation!! I'm sorry you're still waiting for your parcel =( bad luck, your partner is from far away... hope it won't take too long to arrive!!! Spring is here, not very warm yet but not as cold as it was 2 weeks ago either ;) let's hope the season won't take too long to arrive either! Best wishes for little Noah =( hope we will feel better soon!! erg leuke paas dingen maak je! Aww sweet chick fellow..I love her so much..
Ja, ik ben heel blij, het is een leukje! Meis fingers cross dat je binnenkort krijgt cadeautje. Ah..... arme ziel.... weer ziek zijn, Beterschap voor Noah! We've had snow here the past two days--crazy, crazy spring!! 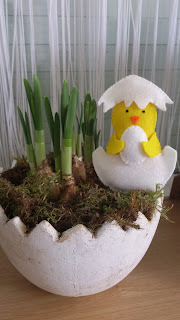 I do love your little chick creations, Annette--both the stitched one and the felt. They're such cheery looking little fellows. Your little exchange chick is ways to cute!!! I'm afraid we are having Easter in winterland!?! !